Bringing products to market is a risk-reward proposition. A good organization spends significant time determining if there is an appropriate ROI for a product prior to risking the capital and time commitments needed to bring the product to market. This is known as the ‘Strategic Product Plan’ that guides an organizations actions in the short and mid-term time horizons. There are lots of potential speed bumps along that path, and some are more costly that they look at face value. Mistakes, they happen. An important key is product design is when they happen. It’s well known that mistakes and failures during the design cycle are expected, and should be encouraged. If no mistakes are being made, it suggests that teams are too conservative and not innovating or pushing the envelope. This is a recipe for being overtaken by your competition. 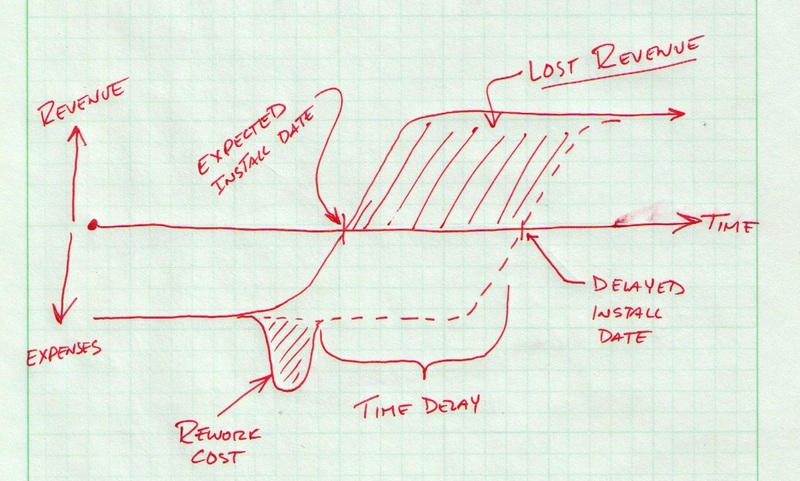 Mistakes after the design cycle, during manufacturing or product deployment are another story. The magnitude of these types of mistakes are often overlooked. Rework cost due to design error: $250 / unit, scrap and rework cost. Time delay for deployment: 3 weeks (21 days) for rework and re-manufacture. There are further costs that are difficult to quantify, including lost opportunity costs to design teams, manufacturing teams and others. This financial pain is also felt upstream in the supply chain because the organization may not pay it’s suppliers until the product is produced, meaning suppliers now have to carry material costs for additional weeks. So what is the message here, don’t make mistakes? No, that is a silly statement to make, in the CPI world any post-it note that says ‘do better’ is thrown in the trash. Mistakes occur from a variety of reasons; some preventable, some not, some caused by typhoons, some caused by time crunches. They happen. The message here is to be cognizant of the full impact of mistakes and production delays to help guide design activities and due diligence at release. One mistake and production delay can be costly, likewise preventing one can be financially impactful! What are your thoughts? Ever contemplate the value of a good/bad decision you made? Rapid Prototypes – Part Deux.